As the latest Apple mobile, iPhone 5 is equipped with dual-core A6 processor, long duration time battery, 4-inch Retina Display, 4G LTE support, 16GB storage and 8-megapixel rear camera. Moreover, the HD camera of iPhone 5 makes it possible to take photos while recording HD videos. Therefore, iPhone 5 is really an ideal multimedia tool for photographing and watching movies. What’s more, with the help of iSight and Retina Display, iPhone 5 makes photographing an extraordinary enjoyment. There are occasions when users need to transfer photos from iPhone 5 to computer. For example, when they desire to edit those photos with iMovie, the transferring of photos from iPhone 5 to computer is required. Then how to transfer photos from iPhone 5 to computer? This is not an easy task. For one thing, as a mobile devoid of Micro SD slot, it is impossible to transfer photos from iPhone 5 to computer directly; for another, since data sharing via USB is not supported by iPhone 5, the transferring of photo from iPhone 5 to computer calls for a third-party app. Therefore, three methods will be introduced on sharing photos on iPhone 5 to computer. As a bridge that connects computer and iPhone 5, iTunes makes the data transferring between iPhone 5 and computer happens via synchronization. 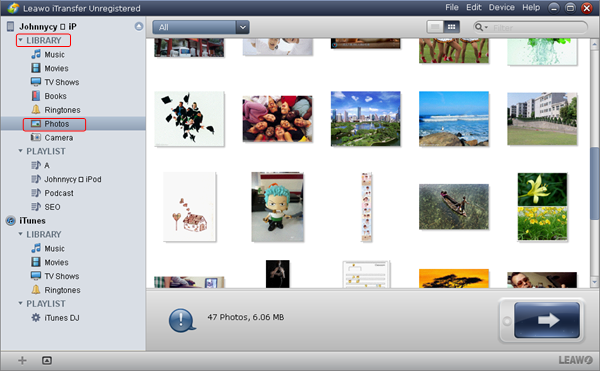 Therefore, iTunes can be used to transfer photo from iPhone 5 to computer. What users get to do is to plug in this Apple device and then choose a computer file to back up those photos on iPhone 5. Download and launch iTunes, connect iPhone 5 with the computer and open iTunes. 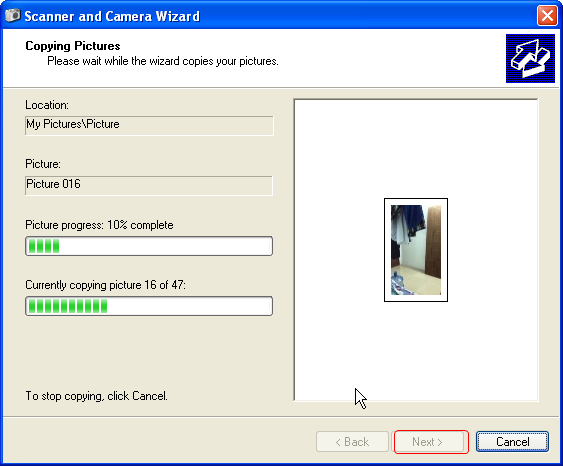 Then a panel named Scanner and Camera Wizard will pop out where one can choose both the photos they desire to transfer to the computer and the computer file he wants the photos to rest in. Click “Next” button and then the photos will be backed up from iPhone 5 to the computer. 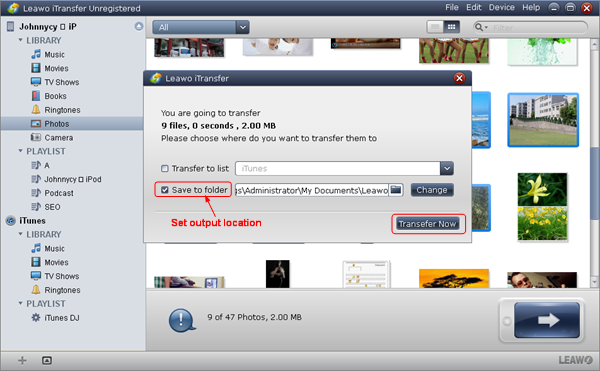 If users have installed iTunes beforehand, they can transfer photos from iPhone 5 to computer easily with iTransfer. Why users want to use iTransfer when they have iTunes already? Comparing with iTunes, iTransfer is not only faster in transferring speed, but also powerful in function. 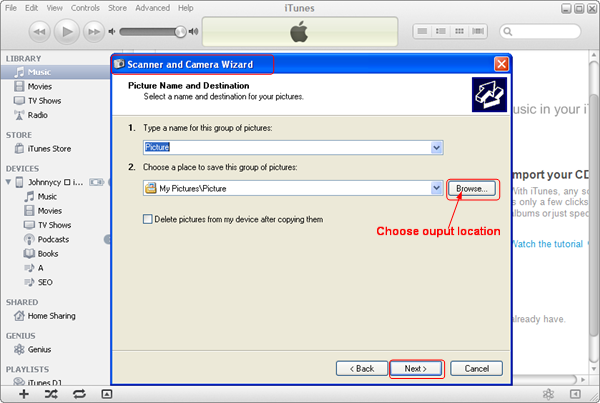 For example, for users who want to transfer photos from an iPod to another iPod, they can only manage it with iTransfer and not iTunes. Download and launch iTransfer, open it and then “Photos” option in the menu of “Library“. Select those photos desired to be transferred from iPhone 5 to computer, right click the mouse and then choose “My Computer” in the drop-down menu of “Transfer to“. Choose location of the output file via “Save to folder” bar and then click “Transfer” button to start the photo transferring from iPhone 5 to computer. As a service playing an important role in maintaining the ecosystem of Apple product, iCloud makes data sharing 0between different Apple devices much easier. 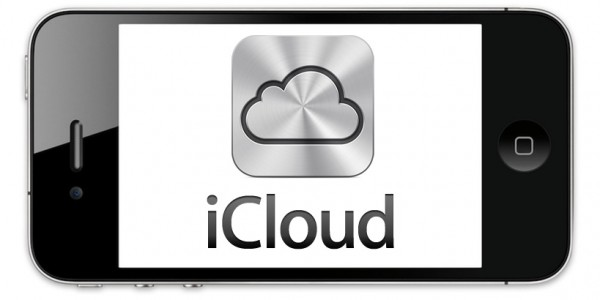 Since its release in 2011, iCloud has gradually employed to various Apple devices ranging from iPod to MacBook. Therefore, one can make transferring of photos from iPhone 5 to computer much easier. Just store those photos on iPhone 5 to iCloud and then download them from iCould using computers like Macbook Pro. However, the method is not a flawless one. For one thing, transferring photos to iCloud from iPhone 5 without Wi-Fi is quite data-consuming; for another, only limited storage is provided free for iPhone 5 users. An iTunes assistant to transfer data among iDevices, iTunes and PC. iPhone 5 is the speculative name for the sucessor to Apple’s iPhone 4S. Apple have invited press to an event at Apple’s Cupertino campus in the USA for the announcement on September 12th. It runs the new iOS 6 software unveiled by Apple. How to Download YouTube Videos to LG G2 for Portable Enjoyment?